An adequate amount of attached gingiva is necessary to maintain gingival health and to prevent gingival recession. Free gingival graft surgery is used to increase the amount of attached gingiva since ancient times. In the 1980s, Miller modified the basic grafting technique to achieve more predictable and successful root coverage. Friedman, in 1962 stated that an inadequate zone of attached gingiva facilitates the formation of subgingival plaque because of improper sulcus closure resulting from movement of the marginal tissue. The Goldman and Cohen concept of 'tissue barrier' stated that the keratinized attached mucosa consists of a dense band of collagenous connective tissue which can retard or obstruct the spread of gingival inflammation better than the loose connective tissue of the alveolar mucosa. ,, So, the keratinized attached gingiva can be augmented to improve the inflammatory problem in the area of gingival recession. Research in the past had proved clearly that areas of gingival recession were more prone to gingival inflammation than areas with an adequate zone of attached gingiva. A fixed orthodontic appliance is one of the major plaque-retentive factors which leads to severe gingival inflammation resulting in future attachment loss in the area of inadequate attached gingiva. The importance of an adequate zone of keratinized attached gingiva before tooth movement for an adequate outcome of treatment cannot be overemphasized. Hence, a similar case is being presented here, where the mucogingival surgery improved the width of the attached gingiva, making the patient fit for further orthodontic treatment. 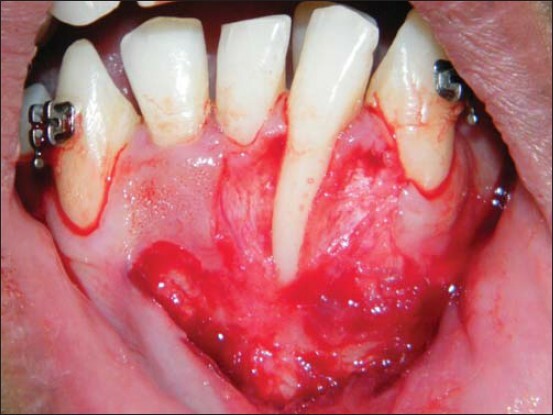 A 21-year-old male was referred to the clinic at the Department of Periodontology of the Vasantdada Patil Dental College and Hospital, Sangli (Maharashtra), for evaluation and treatment of gingival recession associated with left mandibular central incisor region. Orthodontic treatment of the patient had already been started with the maxillary arch. Brackets were placed in the mandibular arch, but due to inadequate width of the attached gingiva, further treatment could not be carried out. On examination, a positive tension test revealed inadequate width of attached gingiva, on the labial aspect of the left mandibular central incisor, with 10 mm of gingival recession (class II according to the Miller classification)  [Figure 1] . The marginal gingiva of the mandibular left central incisor was reddish pink in color, accentuated, soft and edematous, and bled on probing. An intraoral periapical (IOPA) X-ray was taken of the mandibular anterior region to assess the height of the alveolar bone which was found at the cementoenamel junction (CEJ). The patient was systemically healthy and a complete hemogram showed all blood counts within normal limits. As aesthetics was not of great concern due to the site being in a nonrevealing area, it was decided to treat the site with an 'autogenous free gingival graft' to achieve root coverage and to increase the width of the attached gingiva. The patient gave his consent for this treatment plan, and treatment was initiated with instructions for control of plaque, followed by thorough scaling and root planing and free gingival graft surgery. During the surgical appointment, after local anesthesia was achieved, the exposed root was planed thoroughly with a Gracey 1/2 curette. It was followed by biomodification of the root by burnishing a tetracycline hydrochloride solution (125 mg/mL) over the root with a cotton tip for three minutes. The area on the left mandibular central incisor that was to receive the gingival graft was prepared by the creation of a partial-thickness flap; [Figure 2] graft tissue (approximately 2 mm in thickness) was harvested from the palatal side at the level of the left premolars and first molar. After harvesting the graft, the donor site was protected by a prefabricated acrylic stent. 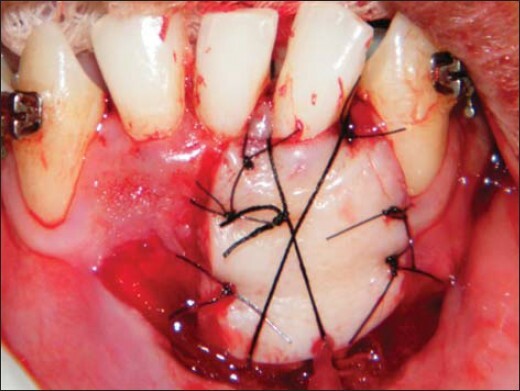 A conventional autogenous gingival graft (approximately 1.5 mm thick) was placed on the prepared recipient site. The graft was sutured in place by means of interrupted sutures (5-0 Ethilon sutures) at the coronal, lateral, and apical corners. A crisscross type of suture was also used to obtain good adaptation of the graft to the recipient site and to avoid dead space [Figure 3]. A non-eugenol periodontal dressing was applied to the recipient site after covering the graft with a sterile aluminium foil. The patient received routine postsurgical instructions, including a 0.12% chlorhexidine mouth rinse twice daily along with 400 mg ibuprofen thrice daily for seven days. The patient was recalled after seven days. The graft had adapted properly to the recipient site and healing was satisfactory. 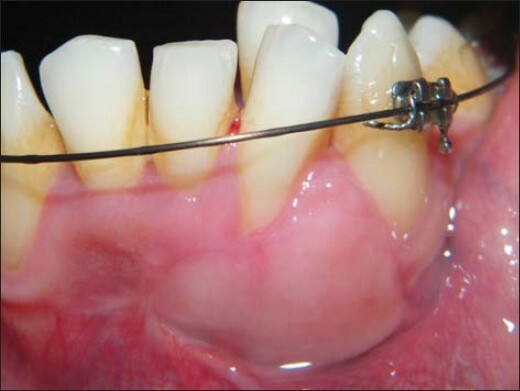 Periodic recall was done every week consecutively for 12 weeks, and 9 mm of attached gingiva was recorded by the end of 12 weeks [Figure 4]. Prior to adult orthodontic treatment, periodontal evaluation must include not only periodontal probing, but also position and condition of the attached gingiva. Sometimes, labial movement of teeth leads to gingival recession and loss of attachment. The risk is greatest when irregular teeth are aligned by expanding the dental arch. 1. Cohen ES. Atlas of cosmetic and reconstructive periodontal surgery. 3 rd ed. Hamilton: BC Decker Inc; 2007. 2. Williams RC, Paquette DW. 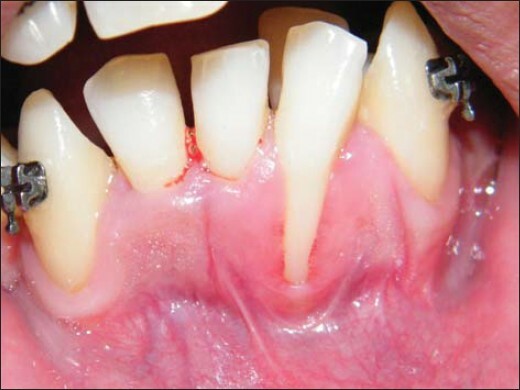 Mucogingival therapy- periodontal plastic surgery. Clinical Periodontology and Implant Dentistry. 5 th edition. Lindhe; p. 955-1001. 3. Lang NP, Löe H. The relationship between the width of keratinized gingiva and gingival health. J Periodontol 1992;43:623-7. 4. Miyasato M, Crigger M, Egelberg J. Gingival condition in areas of minimal and appreciable width of keratinized gingival. J Clin Periodontol 1977;4:200-9. 5. Coatoam GW, Behrents RG, Bissada NF. The width of keratinized gingiva during orthodontic treatment: Its significance and impact on periodontal status. J Periodontol 1981;52:307-13. 6. Miller PD Jr. A classification of marginal tissue recession. Int J Periodontics Restorative Dent 1985;5:9-13. 7. Vandhana KL, Savitha B. Thickness of gingiva in association with age, gender and dental arch location. J Clin Periodontol 2005;22:828-30. 8. William R. Proffit: Contemporary orthodontics. 2 nd ed. Mosby: p. 594-5. 9. Wennström JL, Lindhe J, Sinclair F, Thilander B. Some periodontal tissue reactions to orthodontic tooth movement in monkey, J Clin Periodontol 1987;14:121-9. 10. Boyd RL. Mucogingival considerations and their relationship to orthodontics J Periodontol 1978;49:67-76. 11. Miller OD. Root coverage with the free gingival graft. Factor associated with incomplete root coverage. J Periodontol 1987;58:674-81. 12. Bouchard P, Malet J, Borghetti A. Decision-making in aesthetics: Root coverage revisited. Periodontology 2000;27:97-120. 13. Edel A. Clinical evaluation of free connective tissue grafts used to increase the width of keratinized gingiva. J Clin Periodontol 1974;1:185.